Yes, I am aware that labeling a restaurant in Buenos Aires home to the best empanadas in the city is quite a tall order. However, I can confidently say that with respect to empanadas, thus far in my experience, no restaurant, café, or pizzeria has compared to El Sanjuanino in Recoleta. Centrally located at 1515 Posadas, the restaurant is within a five minute walk of the Recoleta Cemetery, Patio Bullrich Mall, and Plaza San Martin. One might walk by El Sanjuanino dozens of times before stepping foot inside for the first time because of the lack of flashy or distinguishing characteristics visible from the outside. Unlike many places to dine in Buenos Aires, there are no gimmicks here, just great food. For $1.70 pesos, a diner can choose between almost a dozen of the standard varieties of empanadas; choices include baked empanadas filled with meat, chicken, cheese and onion, creamed corn, spicy beef, spinach, tomato and basil, ham and cheese, as well as a fried meat, egg, and olive empanada called El Sanjuanino for $2.50. Also on the menu are offerings of tamales and locro (a traditional Argentine baked meat casserole), neither of which exceeds $10 pesos. In addition to the almost unbeatable price, the empanadas are HUGE. I can usually pack away six empanadas in a sitting without trouble, but after four I was beginning to struggle. In fact, I was in a group of seven people and we ordered 36 empanadas and barely topped 30 before we called it quits. Just to reiterate, we spent about $21 dollars total between seven people for lunch and could not finish! So if three dollars for a delicious lunch or dinner (plus drinks) sounds like your idea of a good time, El Sanjuanino is your best bet. Not only is the price unbeatable, but I dare you to find a better empanada in the city, or better yet, anywhere in the world! El Sanjuanino is one of Epicurious.com top 5 budget restaurants in BA, and has been around for 45 years. Dan over at SaltShaker.net also had some things to say about it. Based on this review we went to El Sanjuanino. Unfortunately, our experience there was very different from Mr. Schuller’s. We ordered a selection of the empanadas (one of each), plus some pasta with meat sauce. 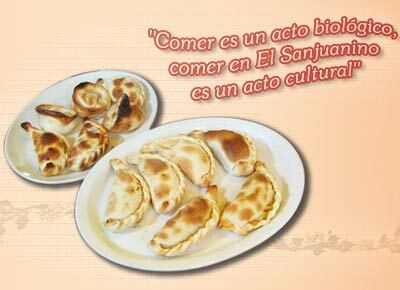 Without a doubt, these were some of the WORST empanadas that we have had during our 4 months so far in Buenos Aires. In fact, my daughter got food poisoning late that night (for the first time since we’ve been here). So, I’d suggest just trying any cafe, pizza parlor, and fine dining resturant. Whenever we go out, we always order an empanada, even just as an appetizer. Part of the treat for us is discovering how every restaurant is so different in their version of a empanada de carne (I always prefer carne picante if availble). My favorite used to be at a restaurant that was at the south-east corner of Plaza Dorrego, though I heard that their recipe has changed recently and isn’t as spectacular anymore. We’ve also had terrific empanadas at small pizza joints around Recoletta, as well as at the fancy, tourist oriented (but still with excellent value for very high quality food) El Mirasol — the location in Retiro close to Four Seasons is our favorite. Anyway, I would definitely NOT recommend El Sanjuanino to anyone. Absolutely horrible!!!! El Sanjuanino this past Sunday. El Sanjuanino was a nice, clean, friendly place that served probably the worse empenadas Ive had in Buenos Aires. The best empenadas Ive had was at the San Telmo feria sold by an nice elderly couple at Plaza Dorrego. It was delish! This page rendered in 0.292 seconds.